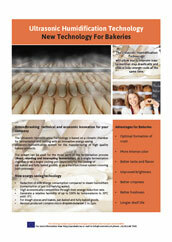 Four bakeries using the UltraBAK technology are reporting their good experiences with this innovative technology. The final Meeting of NanoBAK2 „ Innovative and energy-efficient proofing/cooling technology based on ultrasonic humidification for high quality bakery products” took place on 22nd-23rd of September, 2015 at Molina Larios Hotel, Malaga Spain. Together with ttz Bremerhaven, European bakeries and equipment manufacturers are developing and distributing an energy-efficient and cost-effective technology for refrigeration and proofing. UltraBAK video released - Finest fog makes the difference! ULTRABAK technology has been linked to LEO/Low energy oven FP7 frame work project LEO. NanoBAK2 is based on the outcomes of the European research project NanoBAK (Novel climatic chamber with an innovative, energy-saving nano-aerosol humidification system for the manufacture of high quality bakery products). 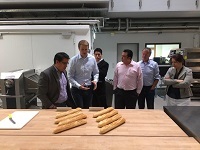 The midterm meeting of NanoBAK2 “Innovative and energy-efficient proofing/cooling technology based on ultrasonic humidification for high quality bakery products” has taken place in Nantes on 18th-19th of November, 2014 at the premisses of project partner BPA Bakery. 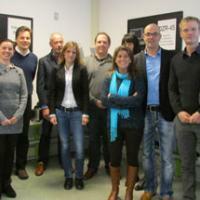 The Kick-off meeting of NanoBAK2 “Innovative and energy-efficient proofing/cooling technology based on ultrasonic humidification for high quality bakery products” took place in Sint-Oedenrode on 20th-21th of November, 2013 at the premisses of its project coordinator CONTRONICS.